Two line SAQ Dynamic Warm up. 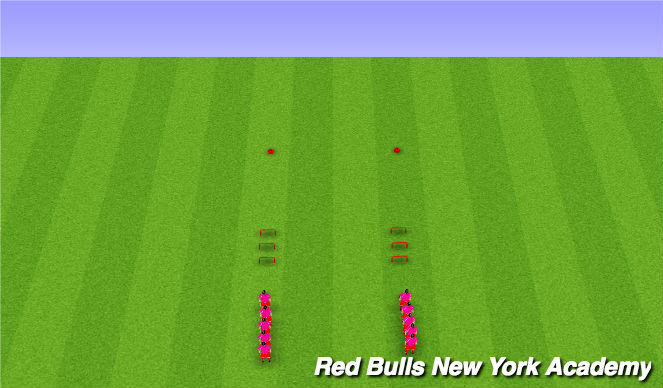 Player perform various dynamic movements, whilst attempting to synchroize those movements within their groups. - Coach plays new ball into area. - Defending team sends 2 defenders to try to win the ball and play back to their own team for a point. - Attacking team attempts to complete 5 passes consecutively for a point. 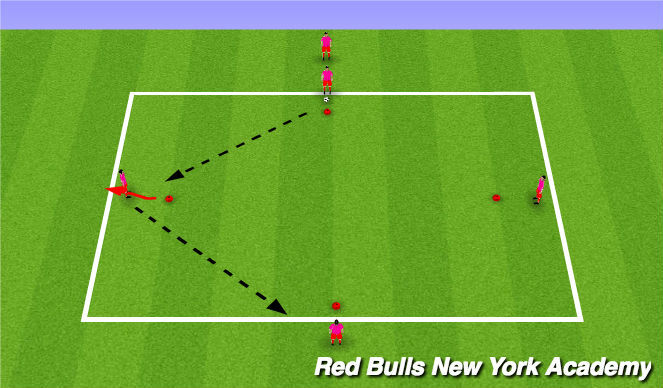 - If ball exits playing area, coach plays new ball into opposite team&apos;s area. - Mentality to go and press the ball (1st defender). - Distance between defenders (2nd defender). - When to press, when to block forward pass. 4v4. Game is first goal wins. Winners stay on. If no goal is scored in two minutes then the team that has been on the longest is out. Winners get a ball and start the next game after every goal. - Speed of thought in transition.